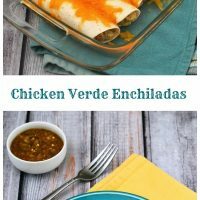 Chicken verde enchiladas are a fast, delicious way to use up leftover chicken or a rotisserie chicken. 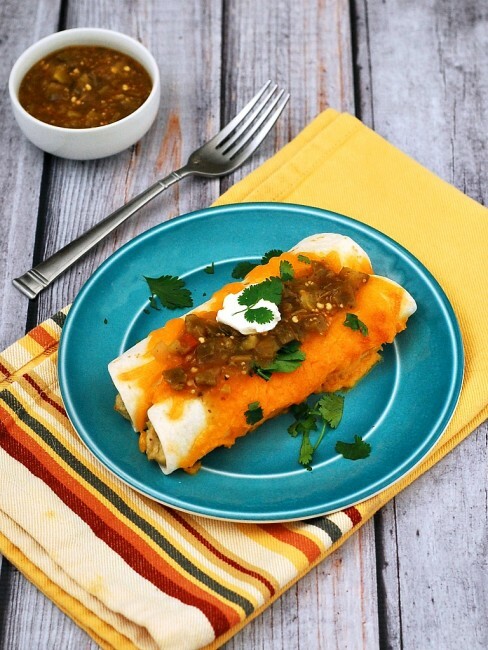 Add a little fiesta to your weekday supper! This is another recipe that I’ve been meaning to share with you for quite some time. It’s one that I found in a cooking magazine, and saved it, because (A) it’s perfect for busy weeknights, and (B) I thought Dave (my fiancé) would like it. He loves salsa verde, maybe even more than regular salsa. If you’re not familiar, salsa verde literally means “green sauce.” While the base of traditional salsa is tomatoes, salsa verde uses tomatillos. Tomatillos are shaped similar to tomatoes, though they are covered in husk that must be peeled away; and they are members of the nightshade family, just as tomatoes are. However, they do have very different flavors. Now, obviously, I’m not going to choose to cook a recipe I don’t think I’m going to like. But I was really surprised by how much I liked these enchiladas! We now make them at least once a month. I keep cooked shredded chicken breast in the freezer just to make these. One other shortcut I take is to use a can of diced tomatoes. It cuts down on prep time, and I don’t have to worry about whether I got a good-flavored tomato (fresh tomatoes can be very hit-or-miss during off-peak seasons). Sometimes I grab a can of diced tomatoes and green chilis for extra flavor. I would imagine that leftovers would freeze very well, but there’s never enough left over for me to test that theory! Preheat broiler to high. Spray a 3-quart (approximately 11 inches by 17 inches) glass or ceramic baking dish with nonstick cooking spray. Set aside. Combine the chicken stock, onion, 1/2 cup of the salsa verde, cilantro stems, jalapeno pepper, flour, cumin, and garlic in a medium saucepan over medium-high heat. Stirring constantly, bring the mixture to a boil. Reduce the heat to medium-low, and simmer for 4 minutes to cook the flour and meld the flavors. Stir in the shredded chicken; cook for 1 minute or until heated through. Remove the saucepan from the heat, and stir in the tomato, sour cream, and avocado. Stack the tortillas on a microwave-safe plate; cover the stack in damp paper towels, and microwave on high power for 30 seconds. Spread the remaining cup of salsa verde in the bottom of the baking dish. Spoon 1/3 cup chicken mixture in center of each tortilla. 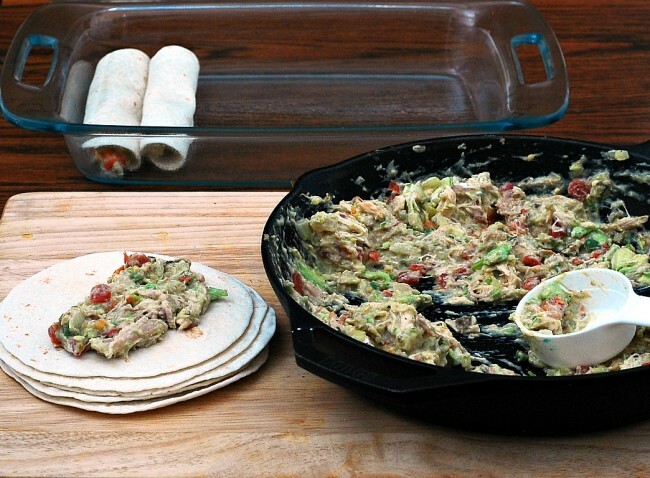 Roll the tortilla up and place in the baking dish, seam-side down. Repeat with remaining tortillas. Sprinkle the cheese evenly over the tortillas. Broil for 3 minutes or until the cheese melts. 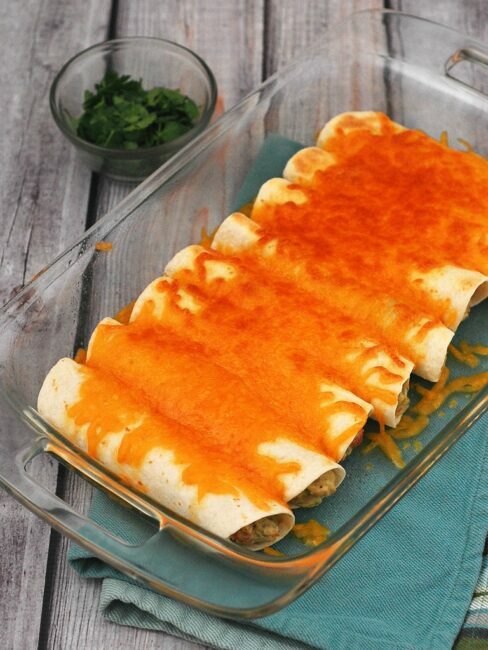 Portion two enchiladas per plate, and sprinkle each with chopped cilantro leaves. 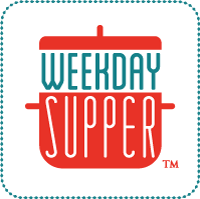 Be sure to stop and check out the rest of the Weekday Supper posts! We love enchies here! Your green ones look divine. Pass me a plate please! Coleen! these look so good! love salsa verde! so fresh! way to go! Happy monday! My kids would go nuts over this! I love how quickly it can be put together! Looks wonderful, Coleen! Great post, especially with Cinco de Mayo around the corner. This recipe has my name on it. I love the GREEN. In fact in restaurants I always order the green.